Henry Venn, secretary of the London-based Church Missionary Society from 1840 to 1872, coined the term euthanasia of a mission to describe the vital process whereby a foreign mission becomes progressively indigenous and independent. His vision of church autonomy was first implemented in Sierra Leone, and the author examines this experiment in detail to uncover the nature of early efforts at constructing an African Christian identity separate from foreign influence and control. Through a detailed analysis of the crises and controversies evoked by African interpretation and appropriation of Venn's vision, the author illustrates the complex interaction of foreign missionary action, indigenous Christian response, and socioeconomic factors in the problematic transition from mission to national church. Venn's ideas had far-reaching influence on the growth of African nationalism, political consciousness, and nation-building. His experiment led to local efforts to merge with the foreign missionary efforts and to an eventual takeover of leadership and mission responsibilities by native Africans. 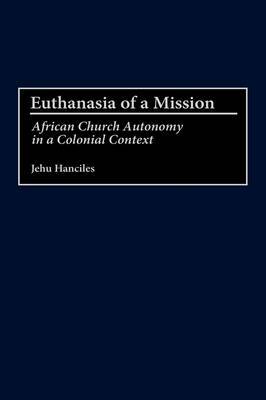 Hanciles chronicles the initial missionary efforts in Sierra Leone, the growth of the mission, the problems that arose, and the emergence of Ethiopianism, a movement which promoted the idea of African nationalism. The book argues that in the West African region, at least, Venn's experiment precipitated some of the most profound ecclesiastical crises of the 19th century and unleashed powerful forces of change that continue to this day. By focusing on the African factor in the intensely problematic transition from mission to national church, this work contributes to the ongoing reappraisal of the significance of African Christianity as a major stream of Christian history.